I hope that Fern rides in the passenger seat. Wow! In all seriousness, it sure helps to be thankful for friends and family as she says, no matter your age. Who knew that girls were being named Fern in 1916?! Meantime, my grandmother Raizl, was hiding from Cossacks & saving her rubles for steerage to Ellis Island. Actually, 1916 was the height of the name’s popularity in the US. During that year, there were 1,332 Ferns born here, according to the Social Security Administration database. Last year, by contrast, there were 86 Ferns born in the US. Who knew? Go figure …..
What did you find on Buffy, ….. or Muffy ? Buffy’s popularity peaked in 1972, when 319 Buffys (Buffies?) were born. By 2017, that number was down to 8 Buffys born nationwide. And this refers to actual full names, not people who are nicknamed Buffy. I had a boss at the Woolworth’s restaurant (Harvest House) I worked at when I was 18 back in 1981. She was about 60 years old (well…maybe 50), had a hoarse voice, and was built like a linebacker. And had a personality to match. The equivalent of a “Baby on Board” sign. I wish the Prius and Toyota Avalons crawling the grocery store mid-day had those types of warnings. Seriously, though, what an accomplishment. Having worked a lifetime, Fern deserves mountains of respect and leisure. The oddness of this sign shows one of those unspoken cultural boundaries. A Happy Birthday message is okay in a newspaper ad, or scrawled in soap on a car window. 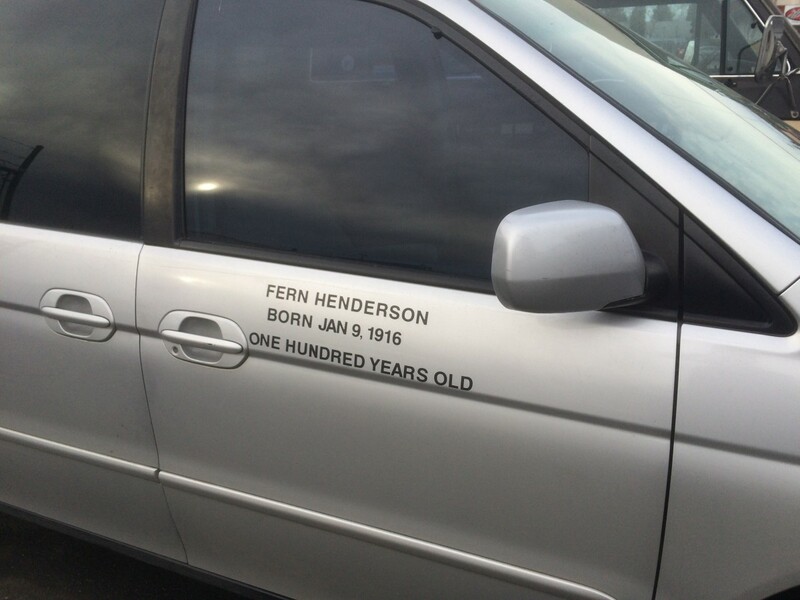 A commercial message like FERN HENDERSON REALTY is okay as a car-door decal. But a birthday message doesn’t quite fit as a permanent decal. I also thought it was odd, but I’ve made up this story in my mind (I sometimes do that), where this was applied to the door when Fern’s family, friends, and the staff at the nursing home held a small parade to celebrate her 100th birthday. This was the vehicle that the guest of honor rode in. I assumed that this wasn’t so much an advertisement as a sort of nameplate. I haven’t seen it often, or lately, but I have seen cases where folks would paint the name of the driver and his “regular” front seat passenger on the doors. I wonder if the driver’s door has anything printed on it? Before Katrina, there was a late 80’s Lincoln around here. It had the names of all the defense contractors on it, applied with those black peel and stick letters. Never did figure that one out.